Isle of Wight Walkers' Map at 32k scale with challenge routes and walking trails highlighted. OS 50k scale mapping is expanded in size to produce a 32k map. The OS features, text and logos are now 50% larger making them much easier to read under outdoor conditions. Isle of Wight Challenge Route (66 miles) is specially highlighted in green and white so that the route stands out against the OS background map. Then we add the Earl Mountbatten Hospice's Walk (26.5 miles) highlighted in gold and white. A large range of 'rights of way' and gps surveyed walking trails are then highlighted in grey and white. The result is an easy to read `OSlike' map with walking trails specially highlighted. We then split the island into East (cover side) and West (reverse side) with a ten mile common overlap to the two sides; meaning you will only have to turn the map over if you are undertaking the longest Challenge or Earl Mountbatten routes. The result is a double sided 840mm by 694mm OSlike Super-Durable Map. We then print the map design on a 100 micron plastic substrate using a special UV curing inks process on the UK's only press capable of using this latest technology. The printed map sheets are then folded using a special concertina map fold to its pocket size of 230mm by 120mm. The result is the Isle of Wight Super-Durable Walkers' Map. A lightweight map that is both accurate and easy to read and use. Super-Durable means your map is waterproof and tearproof, and fully recyclable. 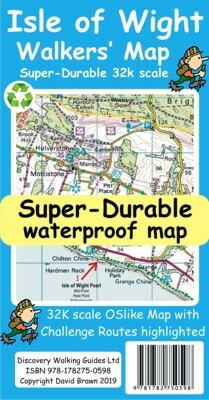 This map will survive anything your Isle of Wight Challenges can throw at it and afterwards will fold up like new. Buying the Isle of Wight Walkers' Map also entitles you to receive the Custom Map digital edition of the map as a free download from Discovery Walking Guides. See the Custom Map information on the map sheet. Super-Durable Maps are printed on a special 100 micron plastic substrate using UV cured inks which produces a lightweight map that feels like silk while being both water-proof and incredibly tough so that after even the toughest of adventures your Challenge Super-Durable Map will fold up like new. All materials used in producing Super-Durable Maps are 100% recyclable in category 2 HDPE.